The 25th International Conference on Atomic Physics (ICAP) is currently taking place in Seoul. This series of conferences is probably the largest, oldest, and most prestigeous series of conferences in the field of atomic & quantum physics. Held only every other year, this year’s conference attracted some 500+ participants to the main conference, but also to the various satellite meetings arranged around it. The nuClock consortium is represented by four groups: PTB (Ekkehard Peik), MPQ (Thomas Udem), TU Wien (Simon Stellmer), and Toptica Photonics (Stephan Falke). They are joined by a number of other thorium enthusiasts: Dave DeMille (Yale), Oscar Herrera-Sancho (ex PTB, now Innsbruck & Costa Rica), Atsushi Yamaguchi (ex PTB, now RIKEN), as well as Noboru Sasao, Takahiko Masuda, and Hideaki Hara (all Okayama University). You asked about the venue? It’s the famous COEX center, right in the middle of the world-famous Gangnam district. More information can be found at the conference webpage. Already one year had passed since the start of the nuClock project, so the time was about right for the first annual meeting. 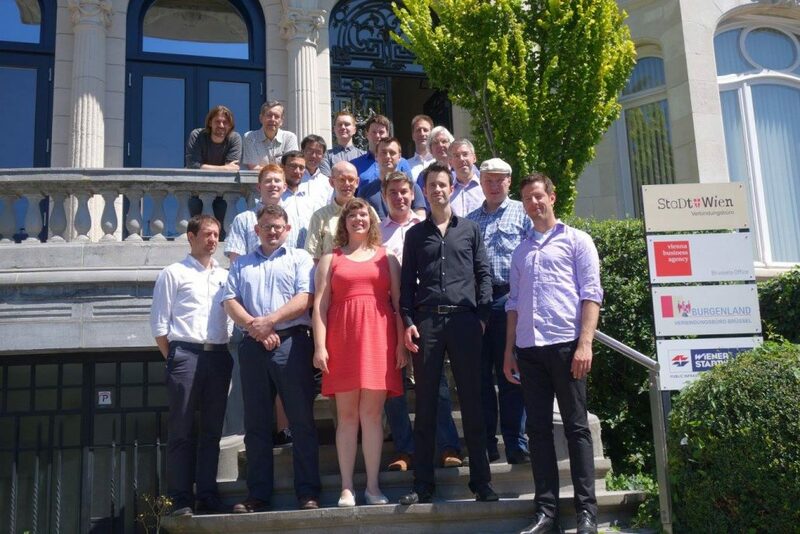 Very much in the spirit of the 2015 kick-off meeting in Munich, this year’s meeting, held in Brussels, featured a number of external guests from outside the consortium. nuClock was very pleased to welcome representatives of RIKEN (Japan), GSI (Germany), and NPL (UK). Monday and Tuesday of this week (July 18/19) were filled with a series of talks, nicely interlaced with delicious food. (From another perspective, one might also say that an astonishing series of meals & drinks got interrupted by talks every once in a while.) 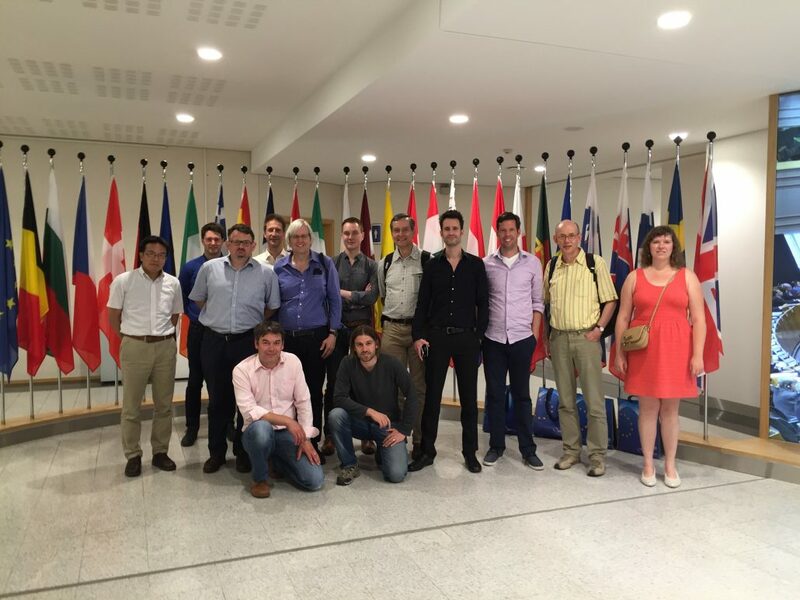 The yearly meeting was concluded by a visit to the European Parliament, where a private tour allowed us to peek into European politics. Thanks to everyone who participated! The next yearly meeting (summer 2017) will be hosted by the MPIK Heidelberg group. Group photo taken at the 2016 yearly meeting. Front row: Giuseppe Larusso (NPL), Stephan Schneider (Vienna), Sarina Geldhof (Jyväskylä), Thorsten Schumm and Simon Stellmer (Vienna). Second row: Brenden Nickerson (Heidelberg), Ekkehard Peik (PTB), Andreas Fleischmann (Heidelberg), Georgy Kazakov (Vienna). Third row: Mustapha Laatiaoui (GSI), Pavlo Bilous (Heidelberg), Matthias Scholz (TOPTICA). Fourth row: Atsushi Yamaguchi (RIKEN), Johannes Thielking (PTB), Christian Enss (Heidelberg). Fifth row: Lars von der Wense and Peter Thirolf (LMU), Ilkka Pahalainen (Jyväskylä), Jürgen Stuhler (TOPTICA). nuClock visiting the European Parliament (notice the UK flag on the far right). nuClock has always had a facebook page, but well… we never really used it. This has changed now! Sarina Geldhof has taken over our facebook page, which is kind of equivalent to fixing a rocket booster to your 35-year old Vespa. Visit our page, like and share what we do, and stay up to date with Sarina’s (almost) daily posts! Two nuClock papers surfaced this week: On Monday, the conference proceedings of last year’s FS&M symposium in Potsdam appeared, with a contribution by the Vienna group (link). The proceedings are free to download. Then on Tuesday, recent work on U-233 doped crystals appeared with Phys. Rev. C (link). This paper had kind of a rough start, cycling through half a dozen review rounds with nearly the same number of referees absorbed. Some of the referees’ remarks were not about the content itself, but rather as to whether the “Thorium topic” is interesting at all. Our most favorite comment by one of the referees (slightly rephrased here): “So a direct observation of the decay of the isomer and determination of its half-life are rather a technical challenge than a highlight in nuclear structure physics. (…) The paper should therefore be deferred to a more technical journal.“. Let’s recall that APS already did publish three “First observation of the thorium isomeric transition” papers, all of which turned out to be false very soon after… Read a beautiful comment by Reinhard Werner (link) very much along these lines. The Phys. Rev. C paper explores a rather new idea to measure the isomer energy by optical spectroscopy, first mentioned a couple of years ago by Eric Hudson’s group (link to the paper). Past experiments used U-233 recoil nuclei adsorbed on a surface (but suffered from low count rates) or synchrotron radiation on crystals (but could never be sure if the isomer was populated at all). The new approach combines the benefits of these experiments: a reliable source of isomeric nuclei (U-233 decay) combined with a bulk crystal (effectively going from 2D to 3D). The expected count rate is orders of magnitude larger compared to experiments using the accumulation on surfaces, and might yield a signal within a few weeks of measurement time. Internal conversion is still expected to be the biggest spoiler, especially since the position or state of the Th-229m ion cannot be controlled.